A jury has found Mark Bessner, the former Michigan State Police trooper charged in the death of a Detroit teen, has been found guilty of involuntary manslaughter. His sentencing is scheduled for May 2 and he was taken into custody after the trial. There were at least 10 Wayne County Sheriff's deputies in the courtroom as a jury reached a verdict. The jury in this trial begin deliberations around 3 p.m. on Tuesday. 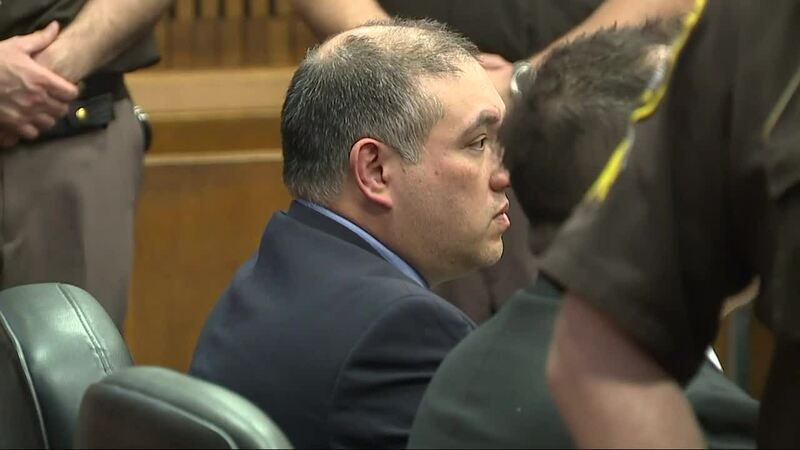 DETROIT (WXYZ) — A jury has found Mark Bessner, the former Michigan State Police trooper charged in the death of a Detroit teen, has been found guilty of involuntary manslaughter. His sentencing is scheduled for May 2 and he was taken into custody after the trial. There were at least 10 Wayne County Sheriff's deputies in the courtroom as a jury reached a verdict. The jury in this trial begin deliberations around 3 p.m. on Tuesday. This is the second trial in the case of Bessner, after a jury failed to reach a verdict in his first trial and a judge declared a mistrial. Michigan State Police released this statement: "Today, former trooper Mark Bessner was found guilty of involuntary manslaughter in the death of Damon Grimes of Detroit. The Michigan State Police appreciates the careful deliberation of the men and women of the jury and we are grateful to the Wayne County Prosecutor’s Office for their dedication to justice. We send our sincere condolences to the family, friends and supporters of Damon Grimes." Bessner was on trial for the death of Damon Grimes, who was riding his ATV in his neighborhood on Detroit's east side in August 2017. He's charged with second-degree murder and two counts of involuntary manslaughter. Closing arguments wrapped up Monday morning. Bessner was the passenger in an MSP patrol car when he and his partner observed a four-wheel ATV being driven by Grimes down Reno and Fairmont Streets in Detroit. When the troopers attempted to stop Grimes for a traffic violation, a pursuit ensued. Bessner claims the teen reached for his waistband two times, leading him to think Grimes was reaching for a gun. The former trooper said he believes he was justified in deploying his taser at Grimes, who then crashed into a parked pickup truck and died from blunt force trauma to his head. "I thought it was at the time," Bessner testified. "I know now, it was a terrible decision." It's illegal to ride an ATV on residential streets in Detroit. Bessner told jurors all they have to do is go to Youtube to see ATV riders in the city are a "huge problem" as they ride 50 to 100 at a time "terrorizing neighborhoods." That testimony contradicts a Detroit Police officer, assigned to the 9th Precinct, who testified for the prosecution that there are no gangs of ATV riders wreaking havoc in the area. Grimes was alone on his ATV. Bessner told jurors that the chase, which only lasted about 45 seconds, began when Grimes came at their patrol car at a high rate of speed. Bessner said he was in the passenger seat and his partner, Ethan Berger, was driving when they began to pursue the ATV whose rider then slowed down. During his testimony, Bessner said that he didn't know if the person on the ATV was "taunting" them or trying to "lure" them into a trap. "I didn't know what to think," said Bessner while also testifying that much of what followed the crash was a blur. Bessner said he doesn't recall whether he first tried to render aid or check Grimes for a weapon. He testified that he was shocked when he didn't find a gun, and also stunned when he learned the person he tased was just 15 years old. Then the 44-year-old began to sob on the stand. "All I could think of was this family lost their son," Bessner said. "And all I could think of was my daughter and what they must be going through. I can't bring Mr. Grimes back and I can't fix my family."